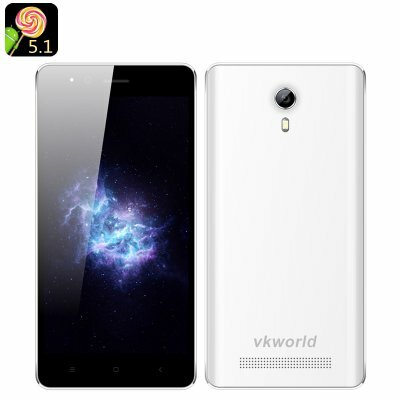 Successfully Added VKWorld F1 Android 5.1 Smartphone – 4.5 Inch Screen, MTK6580 Quad Core CPU, Dual SIM, Bluetooth 4.0, Smart Wake (White) to your Shopping Cart. Get your hands on VKWorld’s latest creation. The VKWorld F1 smartphone comes with a nice compact 4.5 inch screen, Android 5.1 operating system, Smart Wake, 2 SIM cards and more. The VKWorld F1 is the latest model by the famous smartphone maker. It comes with a compact 4.5 inch screen – designed specifically to be conveniently used with one hand. The phone can easily fit into your back pocket as well, and will lighten your daily load, compared to the large screened heavier phablets. You will have Android 5.1 running on the device guaranteeing easy navigation and intuitive interface. Access the Play Store for any apps, tool or games you might need. The Quad Core CPU will make sure that your smartphone is running smoothly and with zero lagging at all times. You will get 8B of internal memory and the ability to extend that with 32GB more on an SD card. The smartphone also comes with 2 SIM cards, letting you easily separate work and fun. Thanks to Smart Wake support, you will have quick access to your favourite apps right from the locked screen. Simply draw a letter on the locked screen (like “C” for Camera), and the app will open up instantly. With the 1850mAh battery, you get up to 3 hours of continuous talk time and 72 hours on standby. This model comes in classic white.